For week 16 of 2019 tips & hacks tick awareness, give your feet space to move and acclimatization time is here. 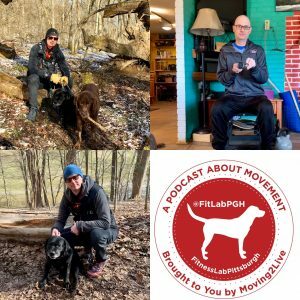 What are your three favorite movement activities in the Pittsburgh area? 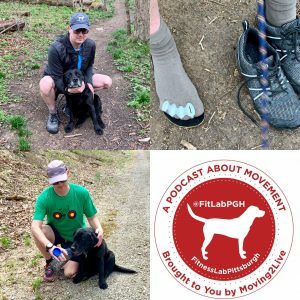 Walking the river trails on the way to the dog parks to catch frisbee, hiking the off-leash dog friendly trails of Riding Meadows in Fox Chapel, walking for as many good causes as we can all throughout the city in the summer. Describe your fantasy movement-focused vacation…cost is not an object…where do you go and what do you do? The beach would be amazing to catch frisbee in the sand while Mikey tans on the beach. What is your go-to weekday breakfast? Your weekend breakfast? I eat frisbees for breakfast all day every day, but sometimes I hear my hooman likes to go to Meat and Potatoes for brunch. What is your favorite thing to eat in Pittsburgh? Note: it does not need to be healthy. Frisbee – sometimes dipped in my favorite dirty puddle of mud. What is the most unusual and/or challenging movement activity you’ve done? Would you do it again? I just learned to dock dive and now can chase my frisbee in the rivers too! Excited as the water keeps me cool on a hot summer day. 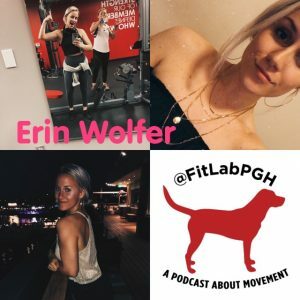 What movement activity/event are you looking forward to in the next year? We just joined the Steel City Dog Disc League and are excited to compete for the title of Pittsburgh’s best receiver. Would you rather go scuba diving or skydiving? I love both the water and the wind on my face. If you give me enough treats, how about we sky dive into a reef? What is your favorite recovery or self-care practice? I nap all day when I’m not chasing a frisbee. I like to stretch and mumble growl to let you know I got the best workout in of all the dogs in the park. What is the one place visitors to Pittsburgh “must” see? West Park in the Allegheny Commons Park on the Northside. It’s an offleash dog park without any fence. It’s a magical place that I get to visit at least once a day to play my favorite game. It’s frisbee, in case that’s not clear. Mikey will certainly welcome you to the park as Mr. Social Butterfly doesn’t let a passerby through without saying hello. 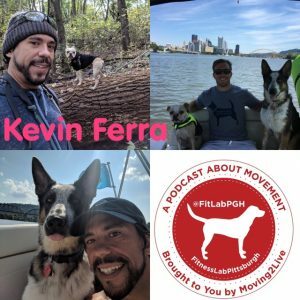 Kevin Ferra (in his own words): Founding Partner of Ferra Executive Search, a boutique recruitment firm that focuses on the higher education and healthcare industries. I originally named my dog “Oprah” in honor of my grandmother that suffered from dementia to help as a memory recall for others suffering as I wanted to train her to become a therapy dog. 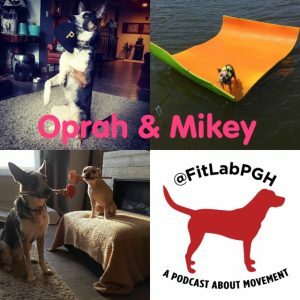 That quickly turned into sponsoring 21 dogs to receive full therapy dog training as the “Therapy Dogs Of Pittsburgh“. This group is already providing an outlet digitally and at universities/hospitals/airport in the area. 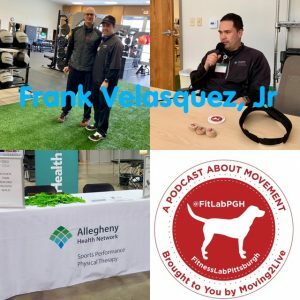 For week 15 of 2019 tips & hacks balance tips and rotator cuff exercises from Frank Velasquez, Jr of Allegheny Health Network Sports Performance and Physical Therapy. 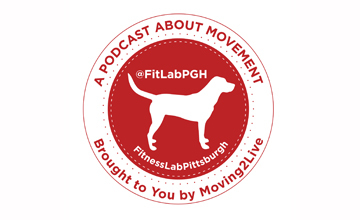 Frank Velasquez, Jr. is FitLabPGH’s first 3-time guest. This time, Frank introduces us to the new AHN Sports Performance & Physical Therapy Center in Wexford and offers tips on preparing for Spring and Summer sports. Frank’s prior interviews were released on September 10, 2017 and January 28, 2018. Frank, is the Director of Sports Performance at Allegheny Health Network (AHN). AHN Sports Performance & Physical Therapy has locations at Cool Springs in Bethel Park (South Hills of Pittsburgh) and at Wexford Plaza in Wexford, PA (North Hills of Pittsburgh). 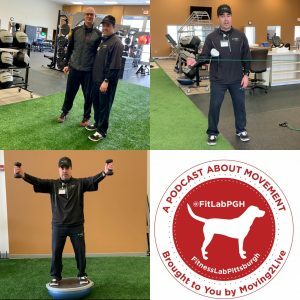 Frank is a Certified Athletic Trainer and a Certified Strength & Conditioning Specialist who has over 25 years of experience working with youth, high school, college and professional athletes, including 16 years in professional baseball and nine years with the Pittsburgh Pirates as their Head Strength & Conditioning Coach. He earned a bachelor’s degree in Kinesiology from the University of Michigan where he served as a student athletic trainer in several sports, including Big 10 Championship teams in football and women’s swimming and diving. In addition to his role at AHN, Frank is currently a Senior Advisor for the Professional Baseball Strength & Conditioning Coaches Society where he plays an active role in planning the continuing education seminar for the strength coaches in professional baseball at the Baseball Winter Meetings. Frank was also the Strength and Conditioning Coach for the gold medal winning TEAM USA for the 2017 World Baseball Classic. Recovery services:We offer services such as cryo therapy saunas, leg compression pumps, assisted stretching along with other wearable technologies that promote muscle recovery. Individual athletes and high school sports teams use these services to bounce back faster after pushing their limits. 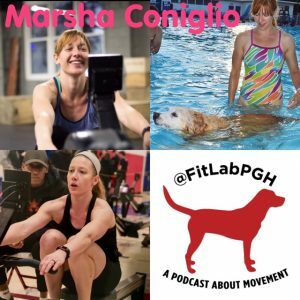 Strength training:Our certified strength training specialists use science supported proven techniques to help you build strength and cardio fitness. We work with people of all ages and activity levels from novice to the elite and professional athletes. Training for young athletes:Our sports performance academy helps young baseball and softball players safely develop their skills. Our TEAM includes professional and collegiate-level instructors giving participants the upper hand in all aspects of the game. National Strength and Conditioning Association (NSCA). World-leading membership organization for thousands of elite strength coaches, personal trainers and dedicated researchers and educators. Student and Professional memberships available. Certified Strength and Conditioning Specialists® (CSCS®). CSCS: professionals who apply scientific knowledge to train athletes for the primary goal of improving athletic performance. They conduct sport-specific testing sessions, design and implement safe and effective strength training and conditioning programs and provide guidance regarding nutrition and injury prevention. Certified Athletic Trainer (ATC). To become a certified athletic trainer, a student must graduate with bachelors or master’s degree from an accredited professional athletic training education program and pass a comprehensive test administered by the Board of Certification (BOC). Once certified, he or she must meet ongoing continuing education requirements in order to remain certified. Athletic trainers must also work in collaboration with a physician and within their state practice act. 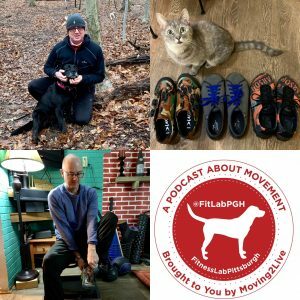 For week 14 of 2019 tips & hacks: moving vs moping and 2 videos to remind you about the importance of footwear that fits. 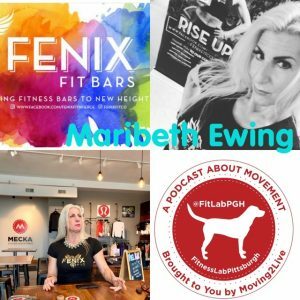 For week 13 of 2019 do you move while you are sick?, tracking resting HR and a tribute to a #lifetimemover.